You will quickly see that they are not only [literally] a physically a stunning couple but also a couple with amazing hearts focused on Jesus. To celebrate their second anniversary, Luciana asked me to create two canvases featuring their wedding vows so they can hang over their headboard. The vows they wrote to one another seriously hold mountains of inspiration. We know that every good and perfect gift is from above, and what a magnificent gift you are to me. I have never admired, nor have I ever adored another person as much as I admire and adore you. It is my promise and my honor to be a faithful steward of you and to treasure you until the Lord calls us home. I promise to lead you, to love you, and to adore you. I promise to serve you, to honor you, and to support you. I promise to do this through patience and kindness, humility and admiration, respect and selflessness, justice and truth, hope and endurance. We have been put together for a purpose much bigger than ourselves and it is my privilege to walk through this life together with you. You are an answer to my prayers, and I will spend the rest of my life thanking God for loving me so much to send me immeasurably more than all I could have asked or imagined. You are the love of my life and my best friend and I am so happy about spending the rest of my life with you. In the presence of God, our family, and friends, I joyfully take you today as my husband. By the grace of Christ and with total dependence on Him, I promise to always love, respect, and honor you. I vow to be your helper, to cherish and encourage you and to be faithful to you alone from this day forward until the Lord calls us home. With all my heart and all that I am, I make this covenant with you and with our Father. Details: Two 16" x 20" wooden canvases with deep frames. 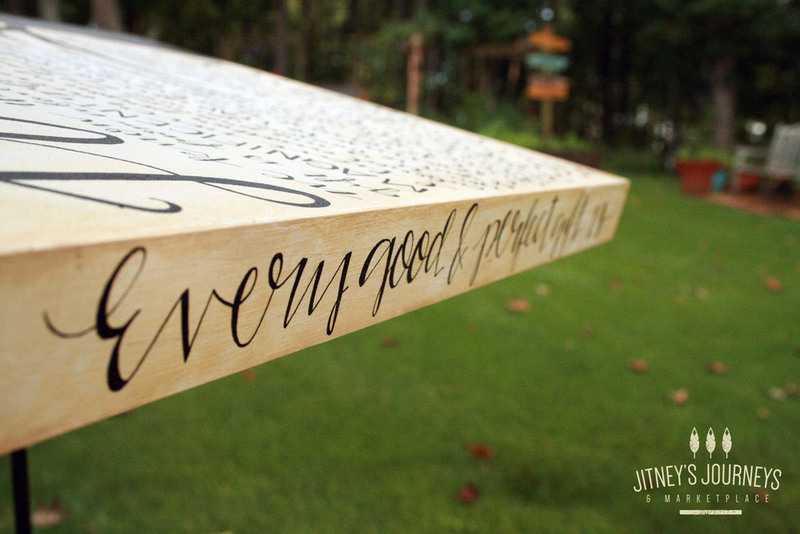 The front of the canvases display Kyle & Luciana's vows (all handwritten). The sides of the frames have 1 John 4:19 and James 1:17 written on them.